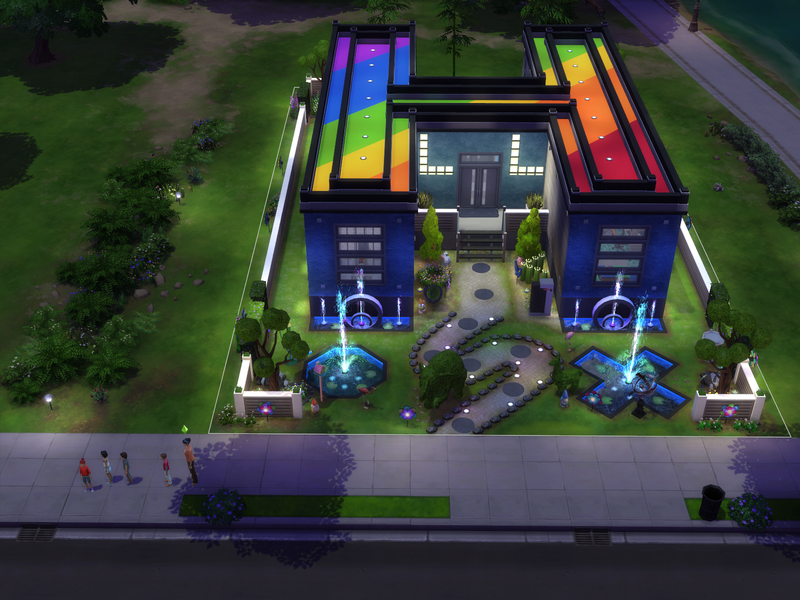 Love the new builds! And wow what a contrast between your newest uploads since I last visited! 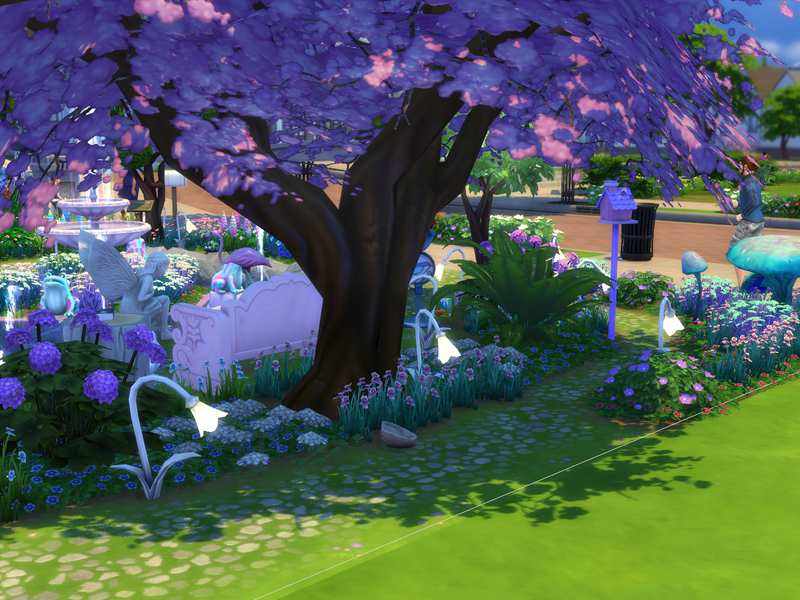 From a pink and girly bakery, to the evil trolls garden.. The bakery is just precious! 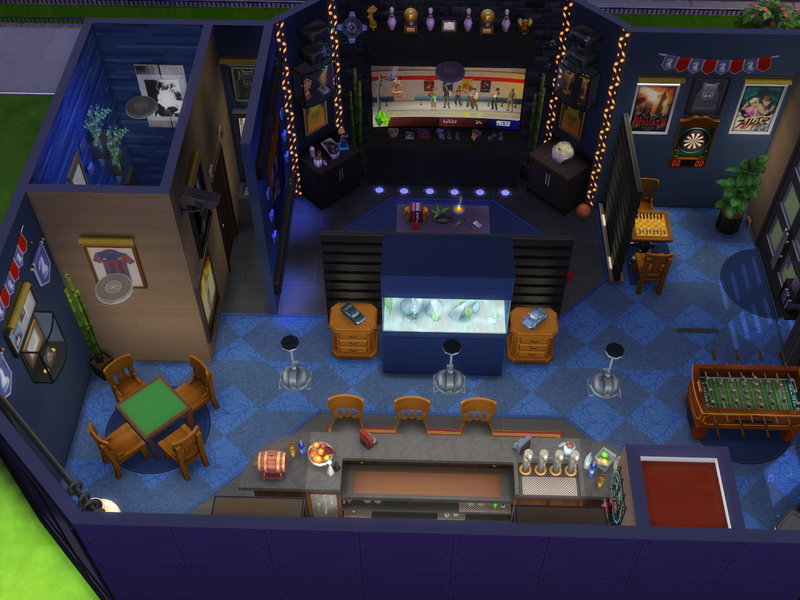 Love that you took a room you created for a challenge and made it into a complete venue! I am actually trying to do the same with my current WIP. And in any case, it seemed like your bakery room was pretty much a full on bakery anyway, so it only needed the exterior. Love the pink, perfect for a bakery! You have an amazing eye for detail, and a creative mind like no other. I don't find it strange at all that your community garden got an award for that, it makes perfect sense And by the way, that is definitely a good thing! @chips46 I love it awesome work! The design and layout of Asian Inspired Bedroom is very nice! Very nice red, brown and green colour scheme of the room. The bed area looks great! Very nice bedhead nook! The square panels, lights and Asian painting on the bedhead wall, and the candles on the bedside tables look very nice! The Asian style pattern of the placement of the floor rugs under the bed looks great! The curtains are a nice touch on either sides of the nook. 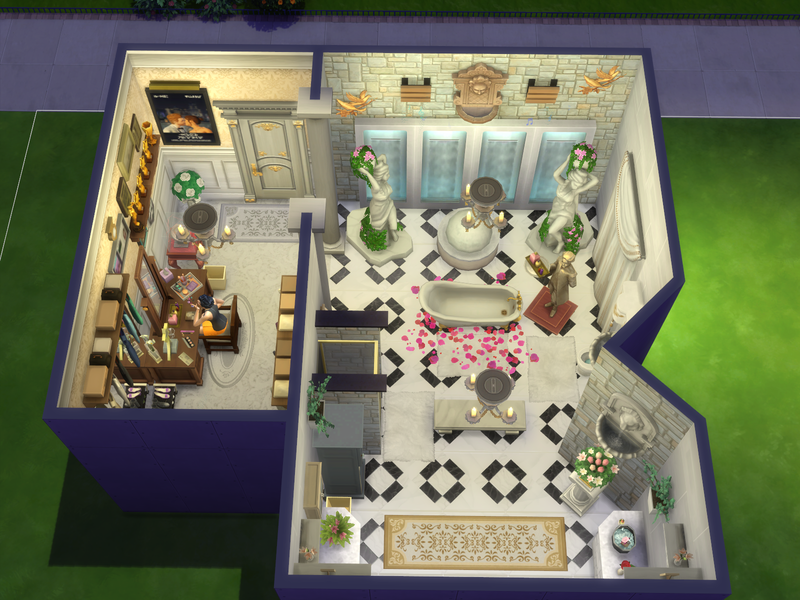 The candles, blossom and plant stone are nice touches in the book case. It is nice that there is restful scenic painting on the easel. 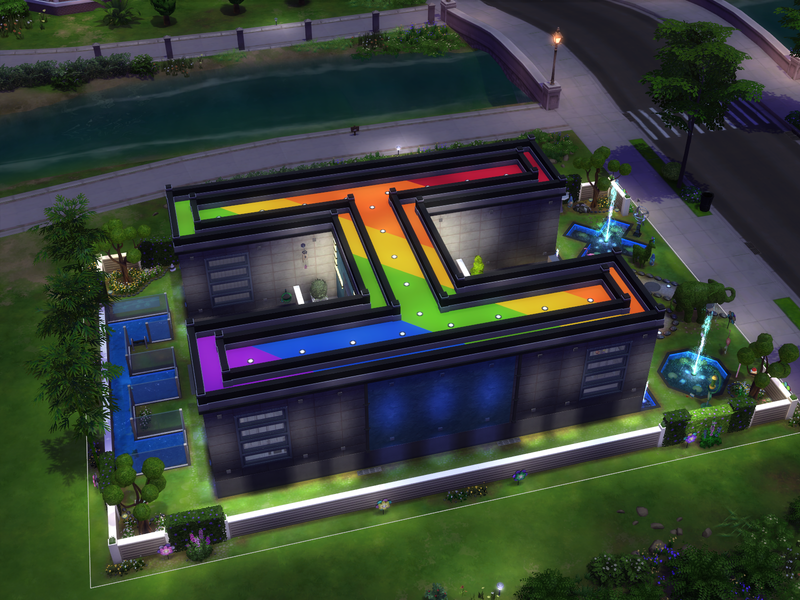 Sims will enjoy painting there. It looks very nice the way the wall of candles and the bamboo plants separate off the sofa seat sitting area. 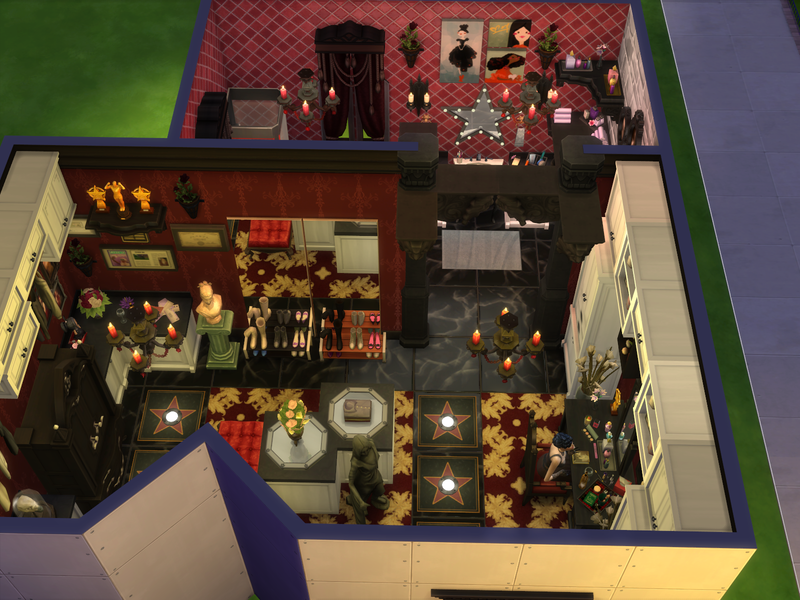 Sims will resting there watching tv or have fun playing console games. It looks great how the planter boxes have been placed on the tv wall! The red candles and the large Asian vase look very nice there. Very nice corner study desk nook! Sims will enjoy using the computer there at the table. 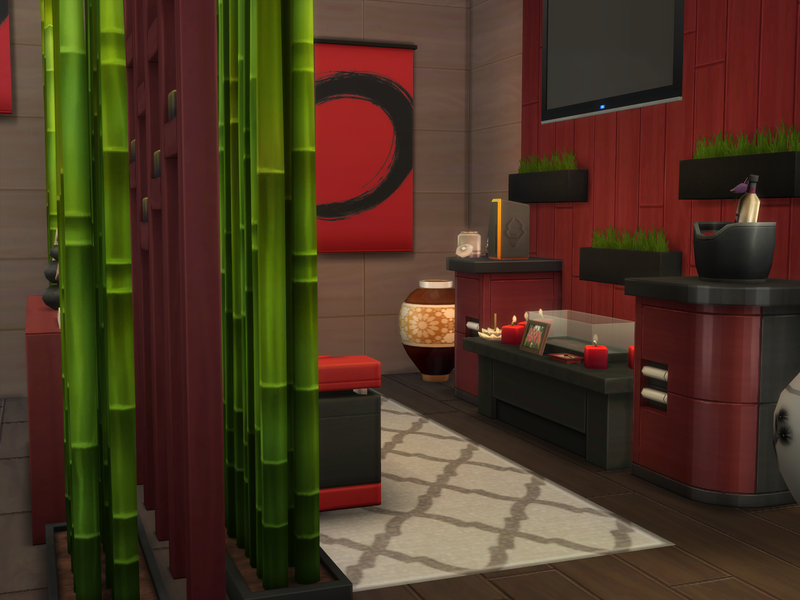 The red colour of the desk chair suits the room theme , and the Asian picture/wall hangings add a great look to the nook area. 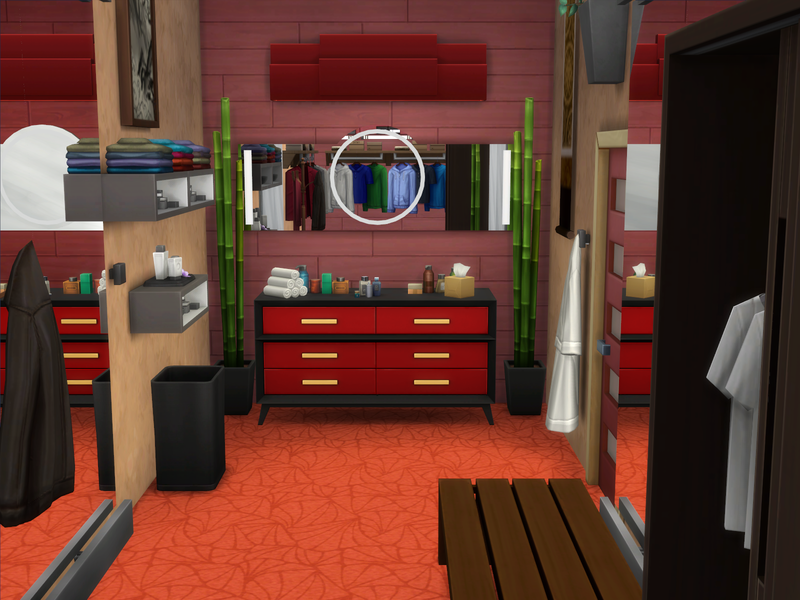 Very nice dressing room area! 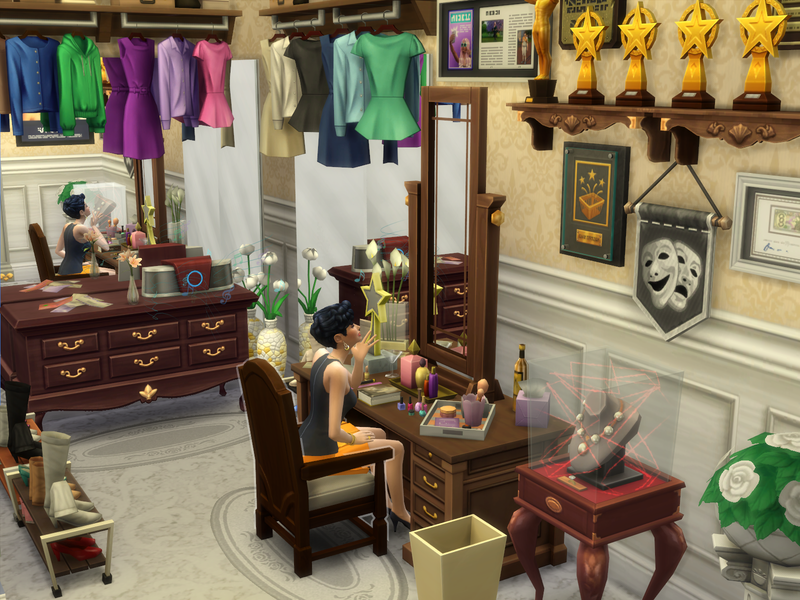 The clothes and shoes racks, the coat stand and the toiletries , tissues and towels on the dresser , folded clothing on the shelving and the hanging robe look great in the dressing room! It is a very nice Asian bedroom! 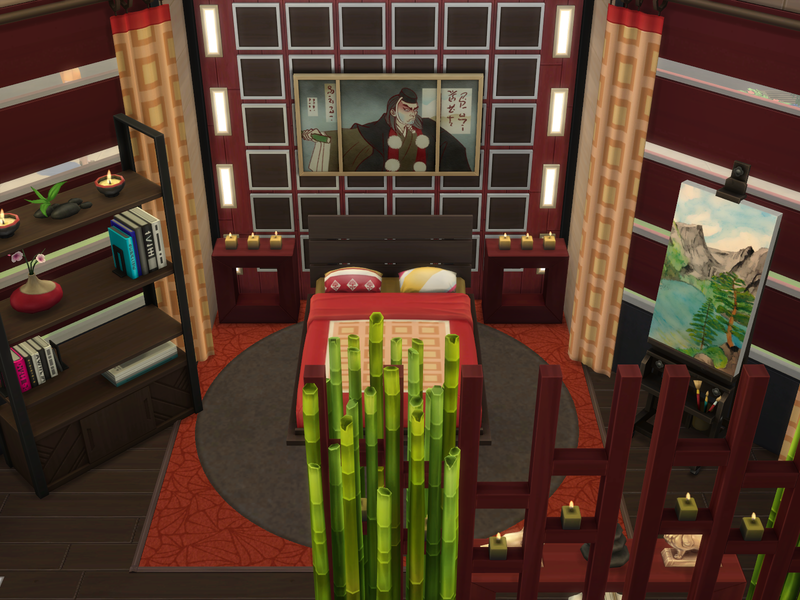 Wow, I love your Asian themed bedroom! The interior design is spotless and I love the the combination of the brown colours of the wood with black and red, it looks gorgeous! Congratulations on Crusty Bakehouse being favourited by Maxis! That is exciting ! 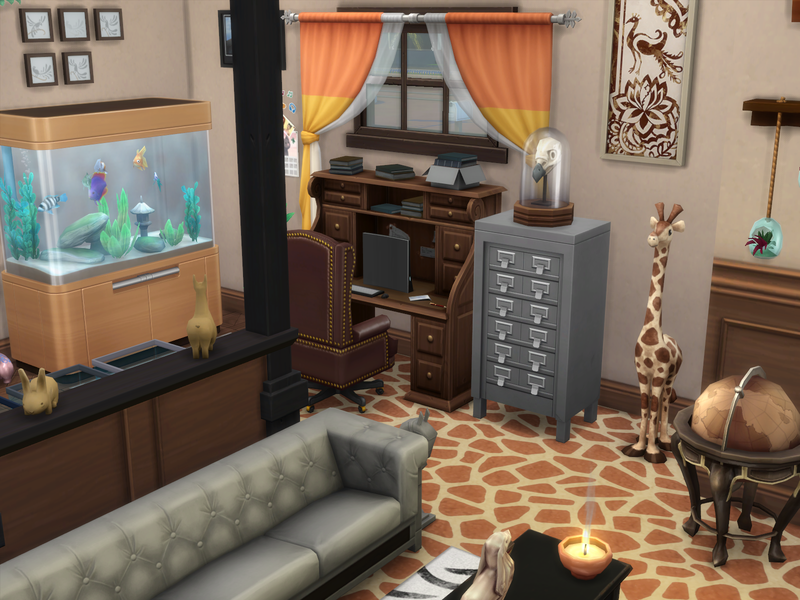 The design and furnishing of Animal Study Room looks very nice! Very nice brown and orange colour scheme of the room. The animal patterned flooring gives a very nice look to the room. The animals throughout the room looks great! 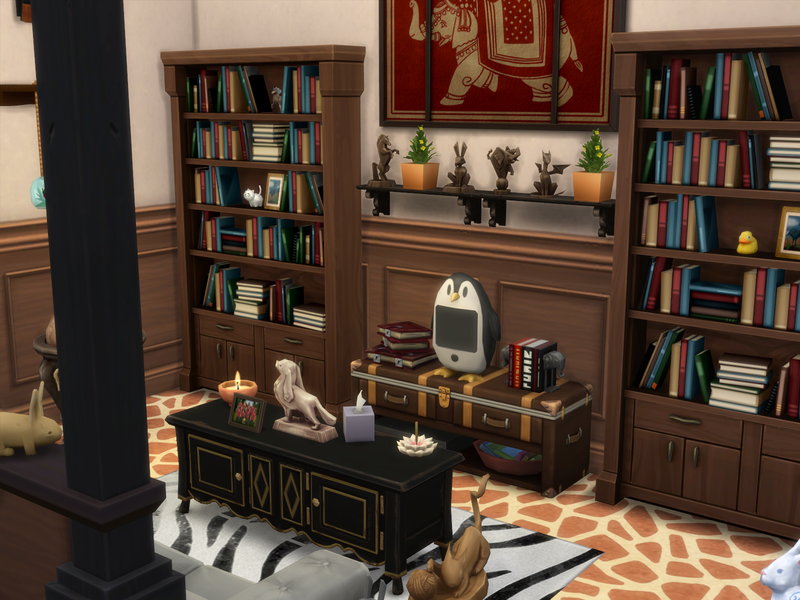 It looks cute that the penguin tv is in the room Nice corner bookcase nooks. The ledge with the woodwork animals and plants looks great! 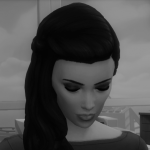 Veronica will enjoy sitting resting after her busy work day on the sofa, watching tv, reading a book, looking at the calming candles and enjoying the nice calming aroma of the incense . Very nice windows study desk nook on each side of the room. . Veronica will enjoy sitting on the leather chair doing her vet work on the computer with sunshine coming in through the windows. The books look great on top of the desk, and the orange curtains look nice. The globe is a nice study touch in the room. The aquarium looks great in the room, with the bird pictures above it on the wall . Very nice refreshments nook, for her to get a cup of coffee. The mugs rack, coffee bag, and wall shelf are nice home touches there. The wall tiling looks nice. It looks great how the middle half wall separates off the room sections. 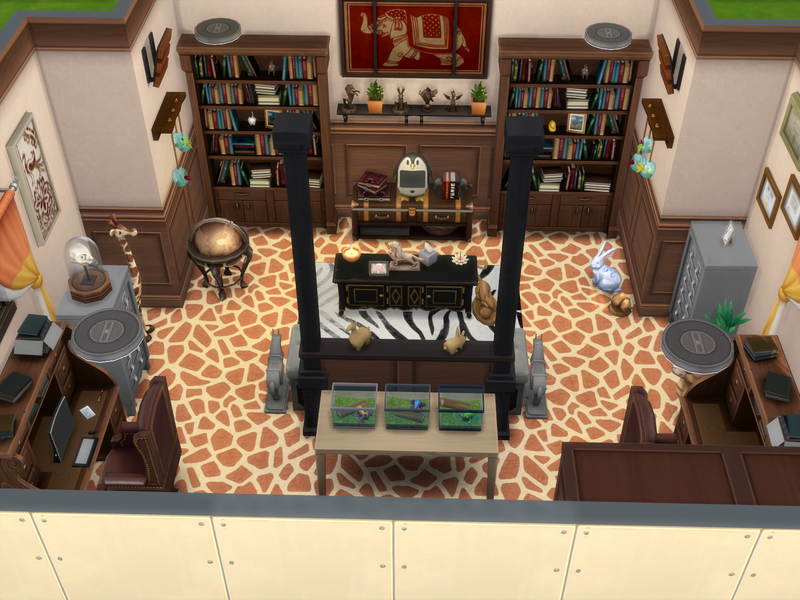 The animal themed pictures, the bunny , deer and the giraffe look great in the room! 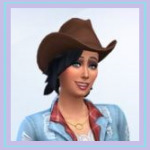 Congrats on your Maxis fav for Crusty Bakehouse and oooh, your animal study is fantastic! Beautiful colours and LOVE your decoration of the room, gives a wonderful lived in feel and such a charming atmosphere. 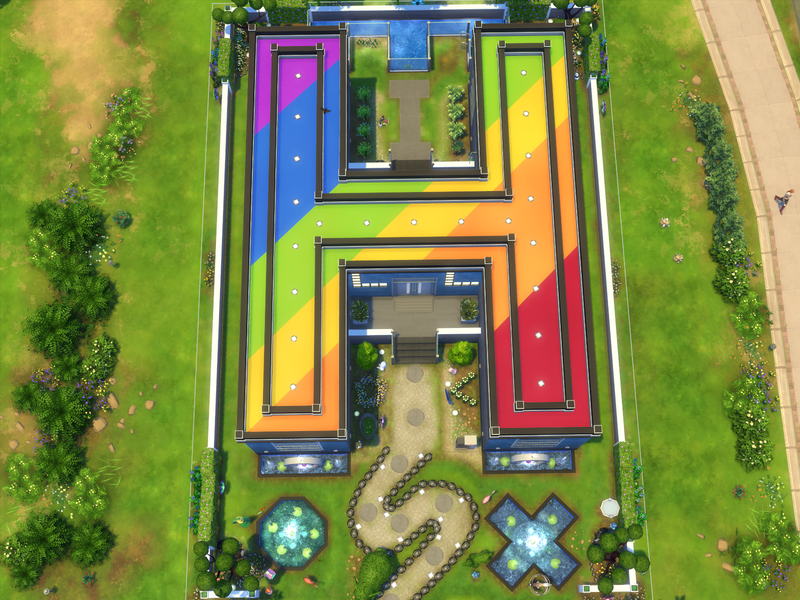 The exterior design of After School Tutoring is the shape of the letter H and the very colourful roofing looks so very, very nice! The lights and black H letter on the roof look great! Each of the areas of the home, both outdoors and inside look very creatively nice! 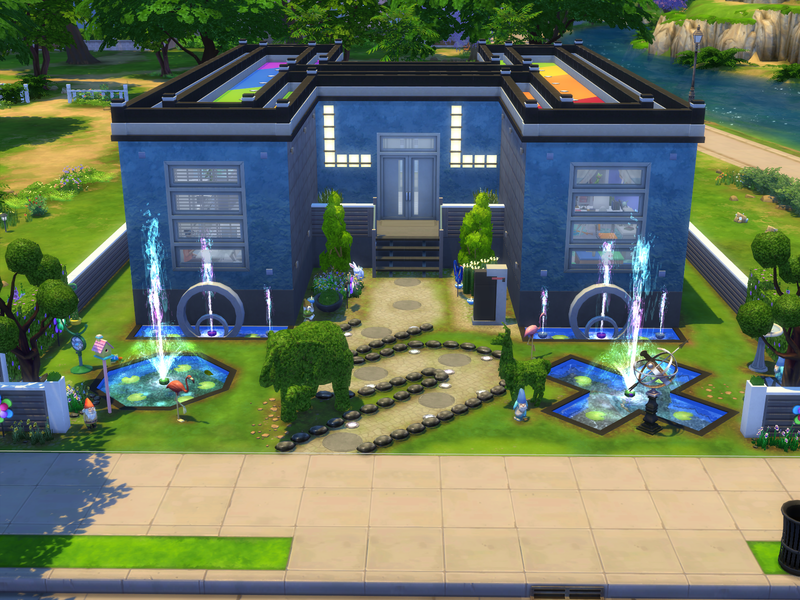 The S shaped front footpath, the V shaped flowers, the O and X water features, the E shaped pool, and the L windows either sides of the front door look great! The water fountain features look very pretty also. 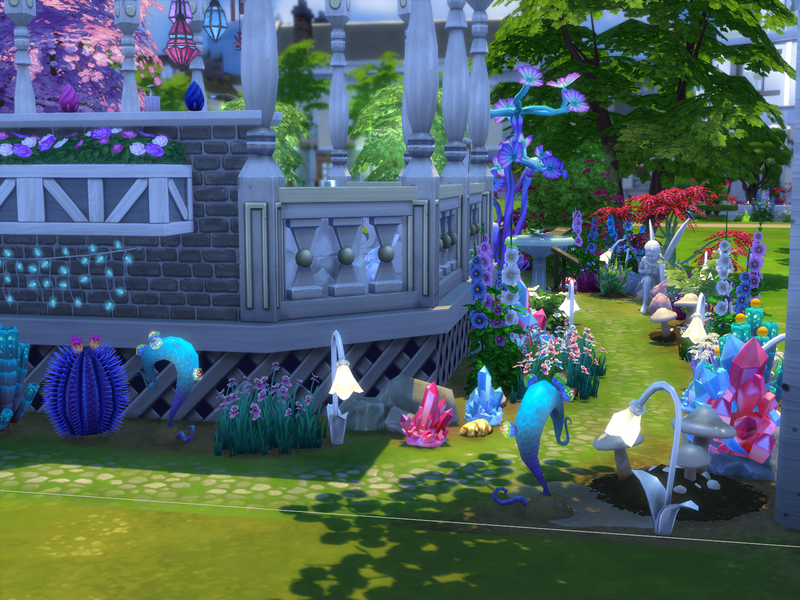 The bunny, birdhouse, flamingos, gnomes,bird bath, plants and flowers look very nice in the outdoors areas, The blue colour of the exterior walls looks very nice. 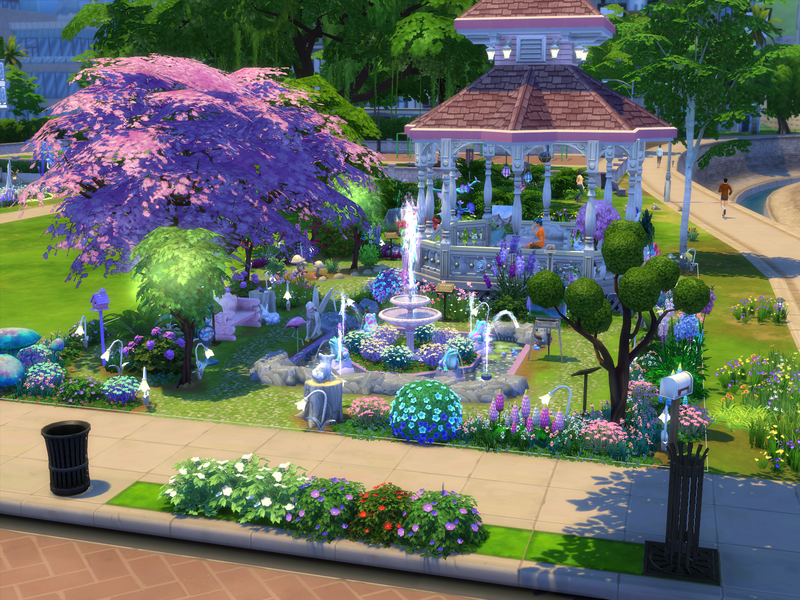 Very nice gardening nook area for sims to enjoy growing and harvesting plants. 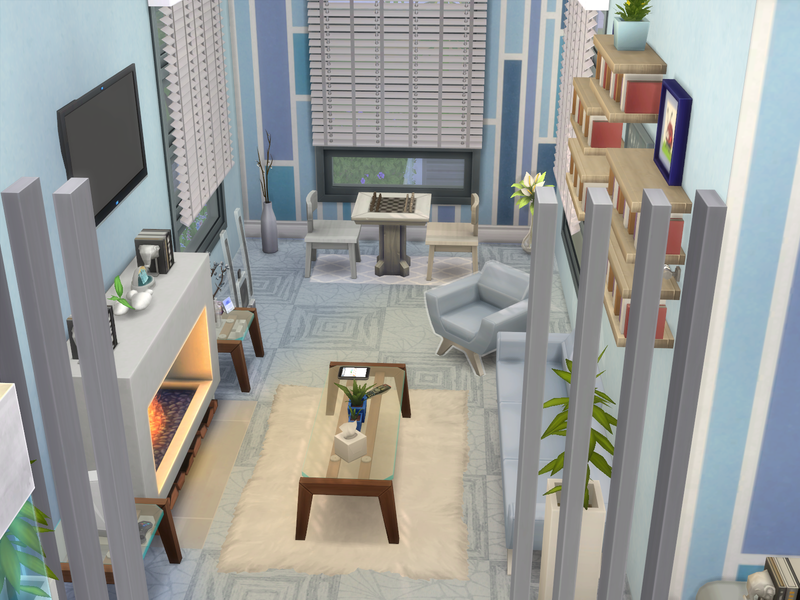 Very nice blue and white colour scheme of the interior of the home.The furnishing of the tutoring room is very nice! The double study desks near the windows looks great! It looks nice how the tables and chairs are face to face and alternative colours are used for each of the tables and chairs. Kids will have nice views of the water fountain through the windows whilst studying there. The H shaped floor rug looks great! The frog rug looks great on the flower rug! The animal and books pictures and posters look cute and great on the wall! Nice sofa seat sitting area for reading books. The koala is cute in the room! 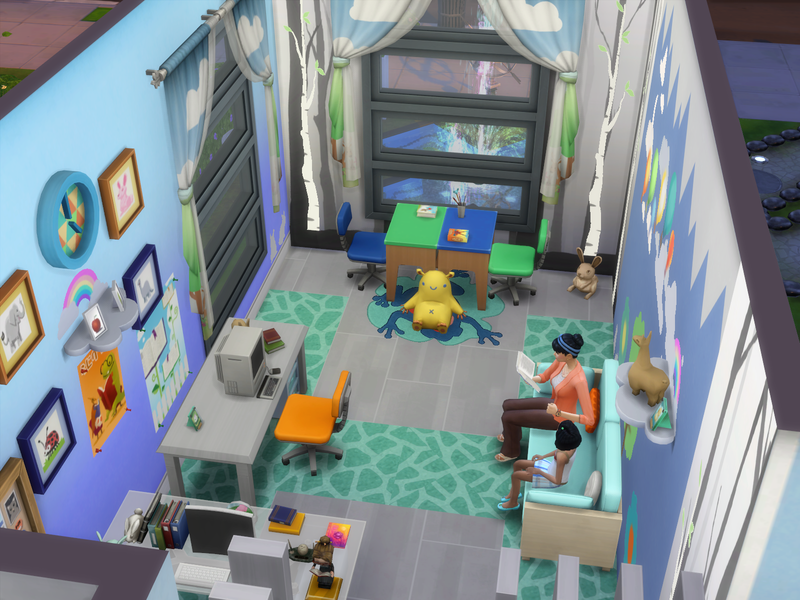 Nice study desks for sims to enjoy using the computers at. Very nice entrance area. 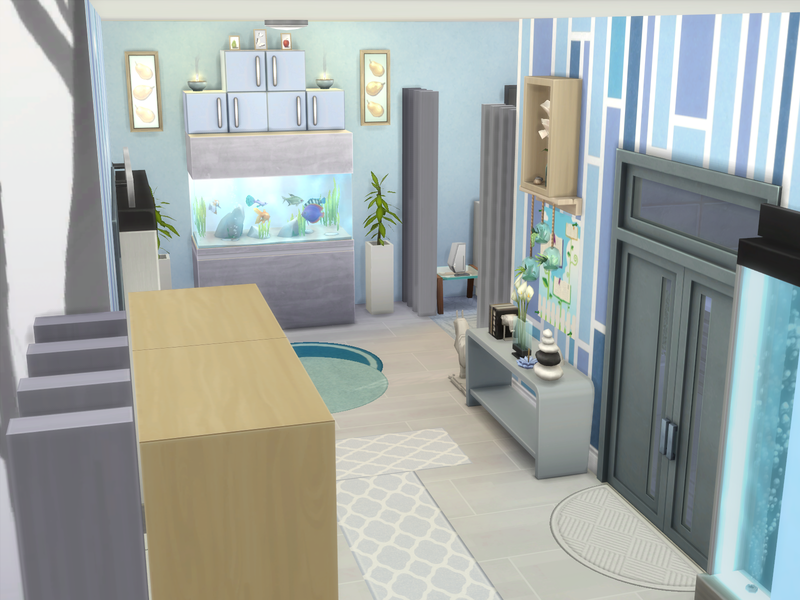 The aquarium is a nice touch there and the cabinets, candles and pictures look great on top of it. The pears pictures look nice either sides of it. Very nice armchair and sofa sitting area in the living room for sims to relax and watch tv or read a book, in front of the fire, whilst listening to the stereo music . They will enjoy playing chess there at the windows table. 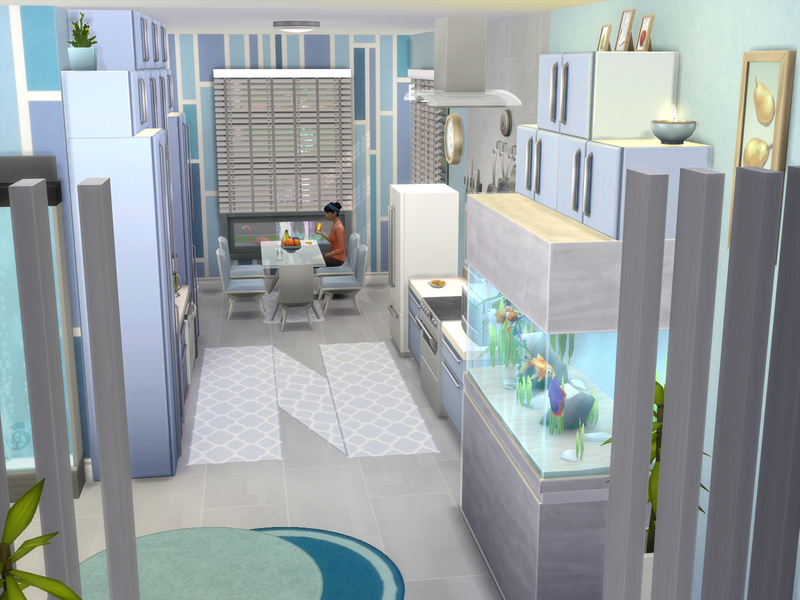 Very nice kitchen and dining nook! The N shaped floor rug looks great! It is a very nice alphabetical home! 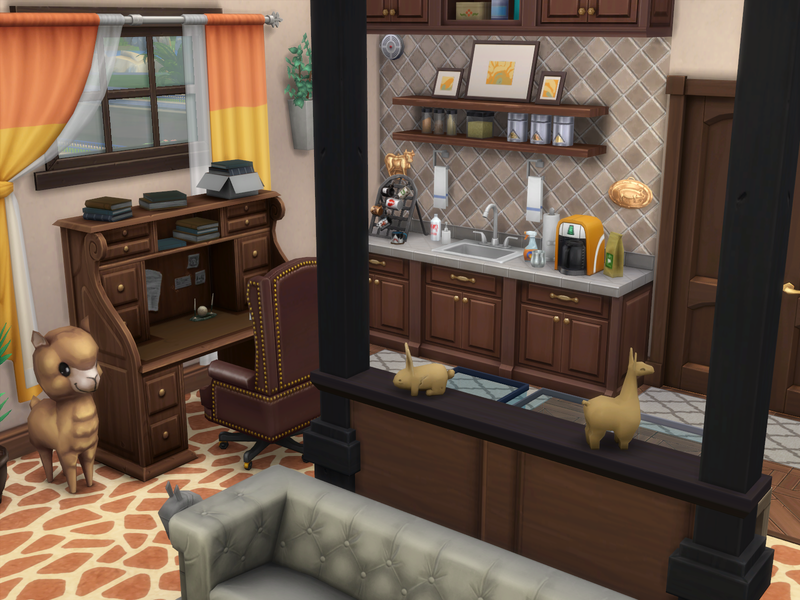 The layout and furnishing of Fun and Games looks very nice! Very nice blue colour scheme of the room. The chequered flooring looks very nice.The design of the tv watching nook is so very nice! The sporting trophies , bowling pins and glass sport shirts on the shelving above the tv, and on the side shelves look great! The orange lighting strips look very nice there. The large sports picture on the wall and the squares decor around it looks great! The ticker tapes are a great touch there. 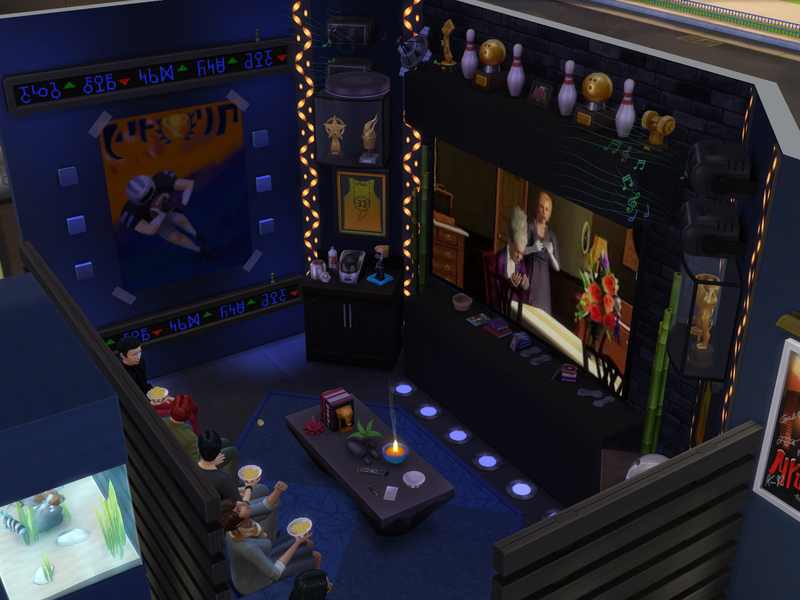 Sims will enjoy sitting relaxing there watching tv and eating popcorn. The aquarium is a nice touch in the room. The cars look great on the tables either sides of the aquarium. 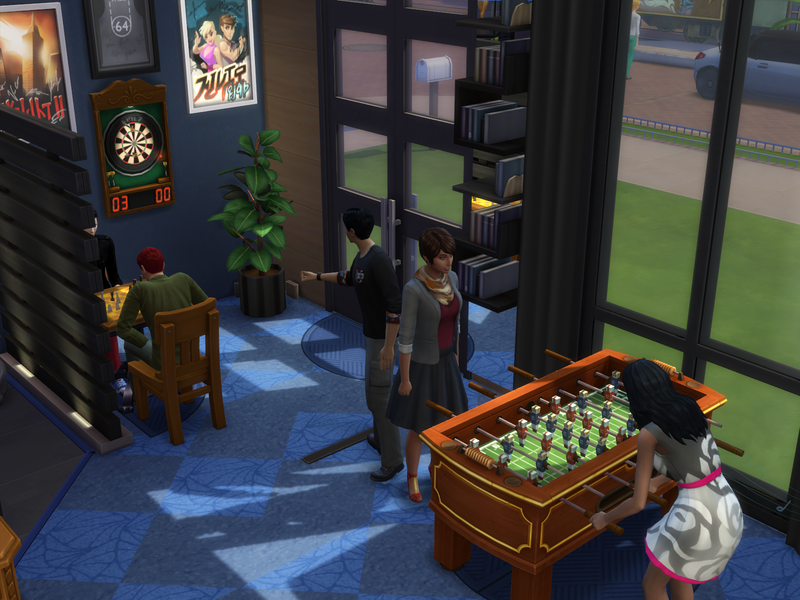 Very nice nook areas for sims to have fun playing card table game, darts, chess and foosball in the room. The movie posters look great on the darts wall. Very nice design of the bar counter area! The drinks cabinets, bottles shelves, nectar rack, neon bar sign and sporting pictures look great on the wall! 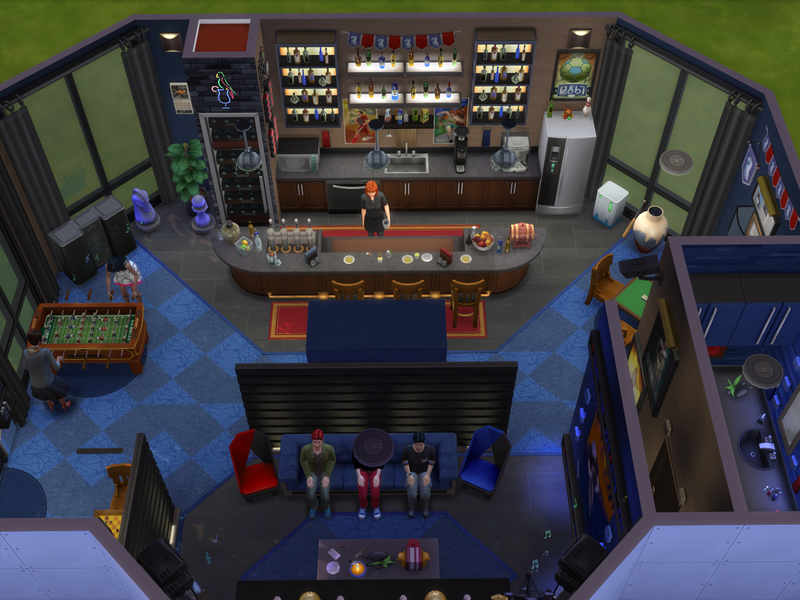 Sims will enjoy sitting on the stools there having a drink from the bar. 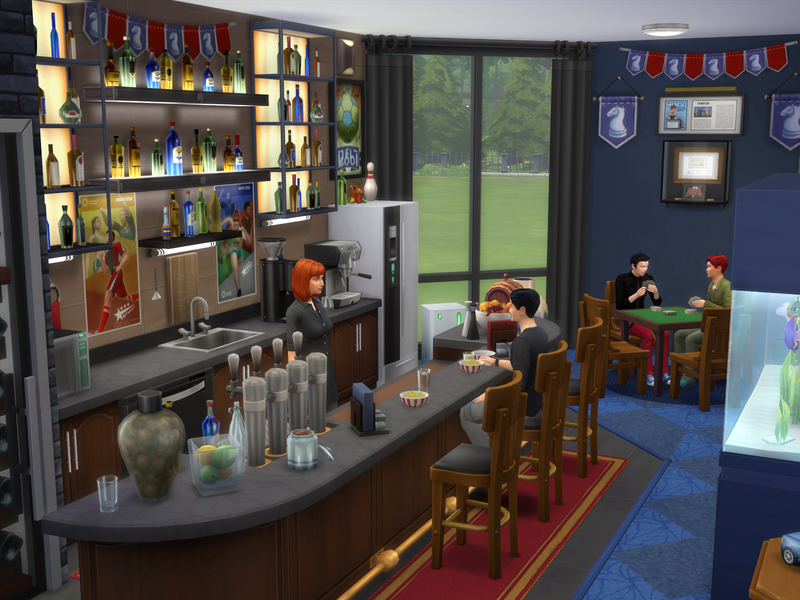 The keg and fruit bowl are great touches on the bar counter. 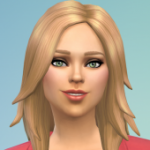 Sims will enjoy dancing to the stereo music. A very cool room @chips46 d'loaded & faved! 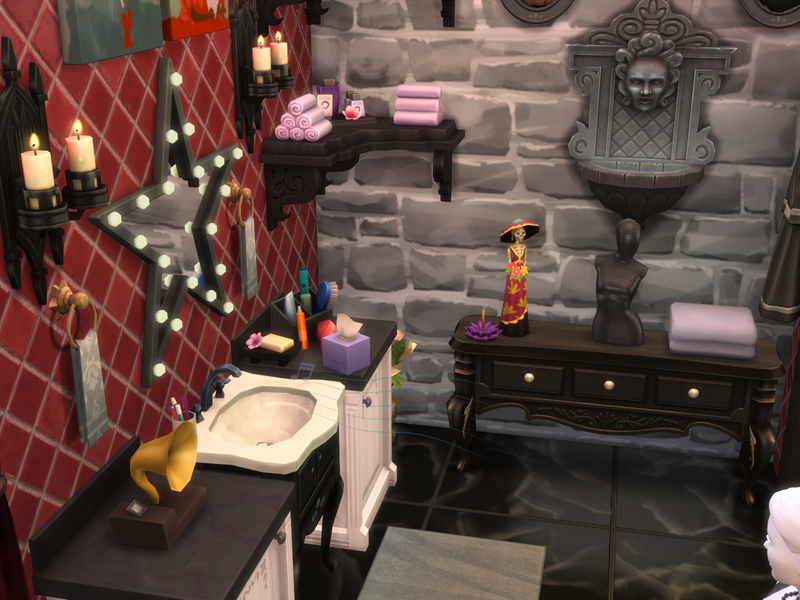 Both bathrooms are very glamourous! 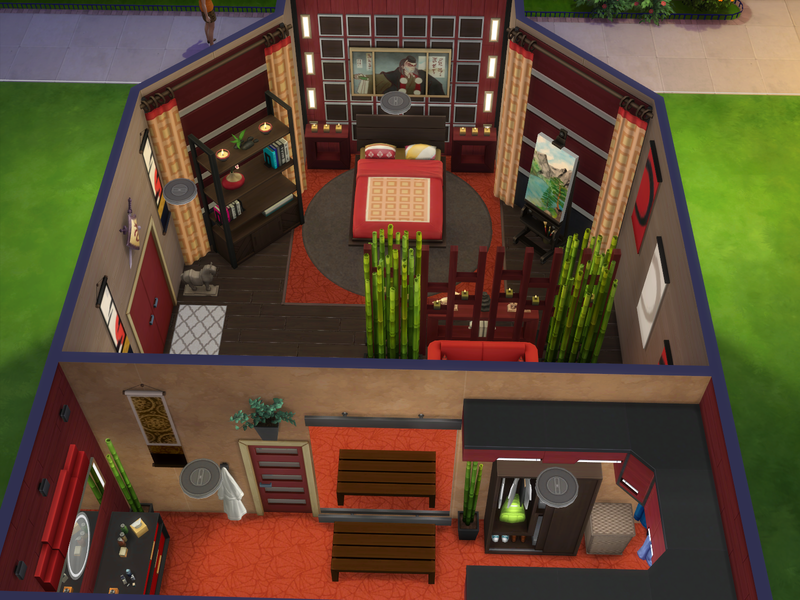 Very nice furnishing and layout of each of the rooms! 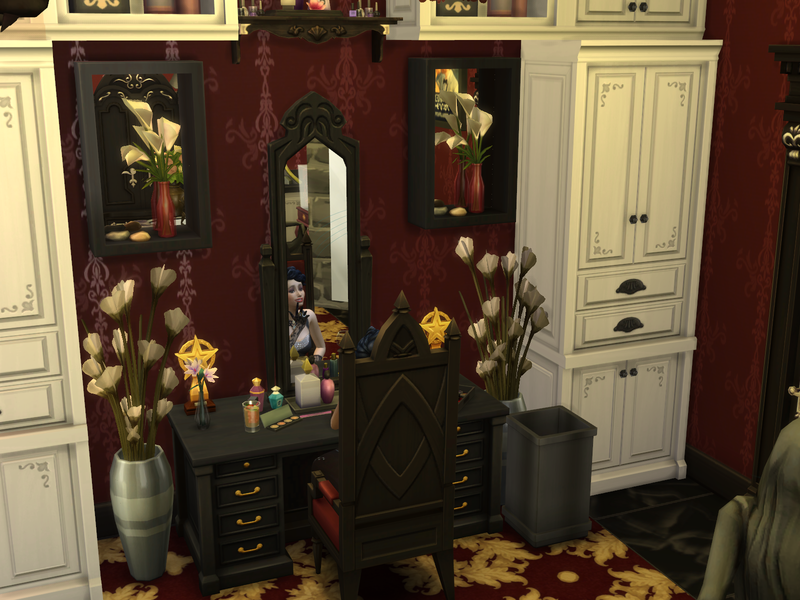 The dressing and vanity table area in Glamourous Bathroom looks very nice! 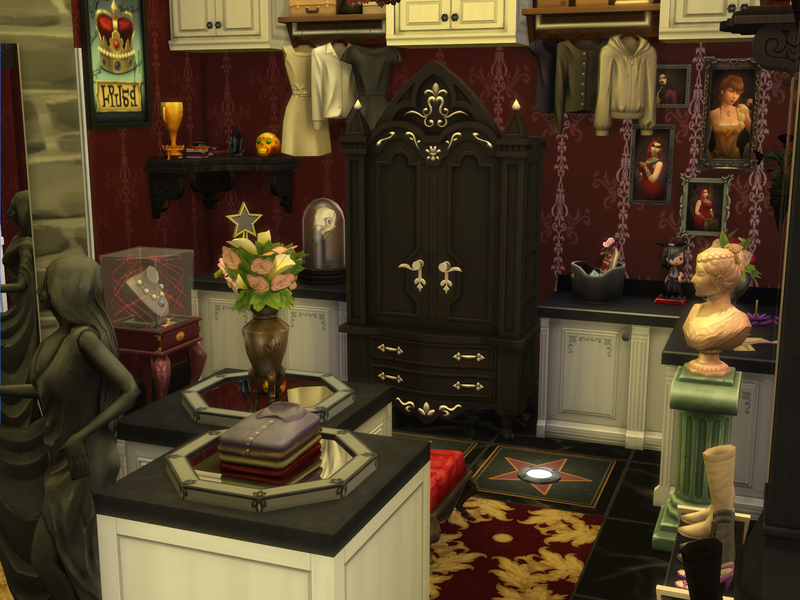 The beauty products are a nice touch on the vanity table and the nearby necklace looks nice. It is nice that Grace's film awards are proudly on display on the wall shelf and on the wall ! The clothes racks look great on the walls. She will like reading her fan mail there! She will enjoy listening to the radio whilst doing her makeup. Very nice double sink counter nook! 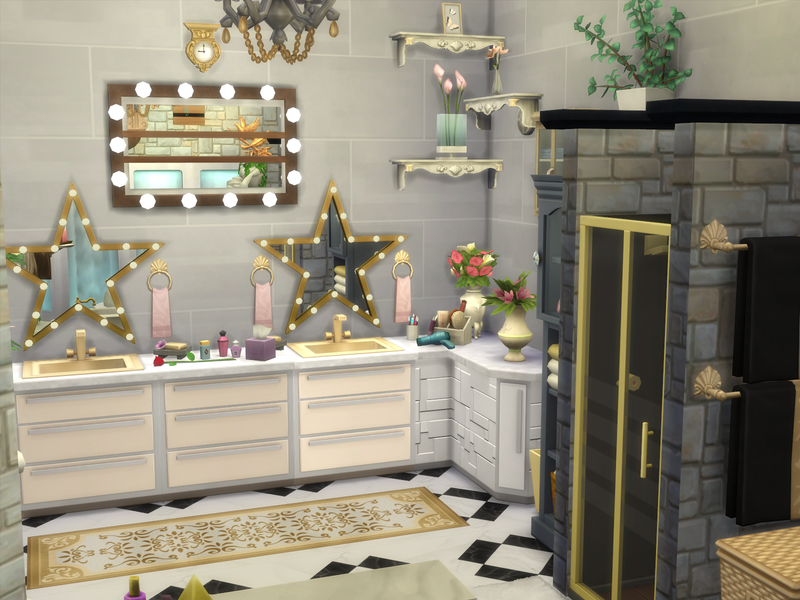 The starry and lights edged mirrors look very nice! 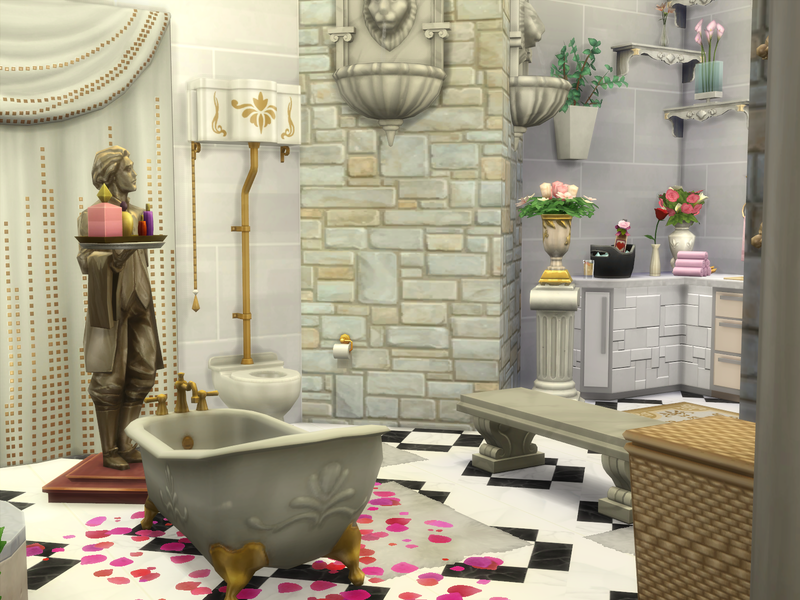 The pink towels, and the flowers on the counters , pedestals and wall shelves are very pretty touches! The shower nook is great! 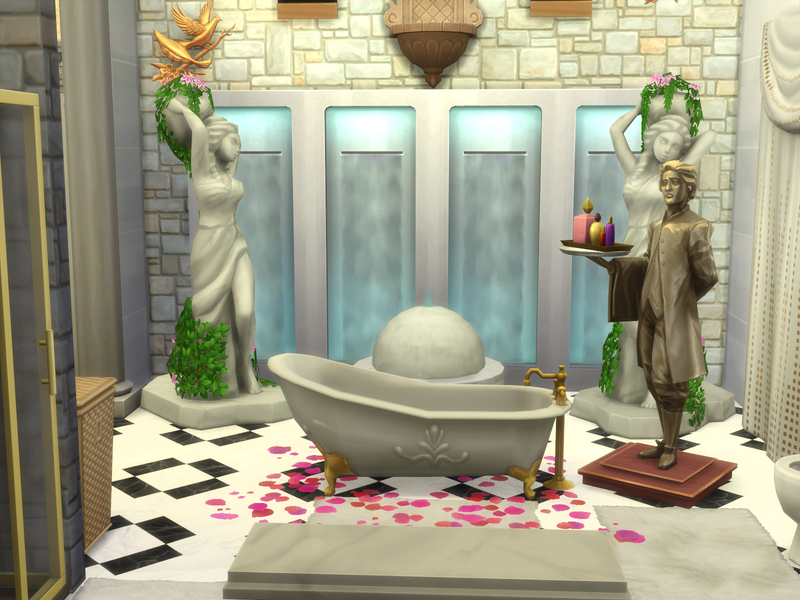 Very nice bath tub area! 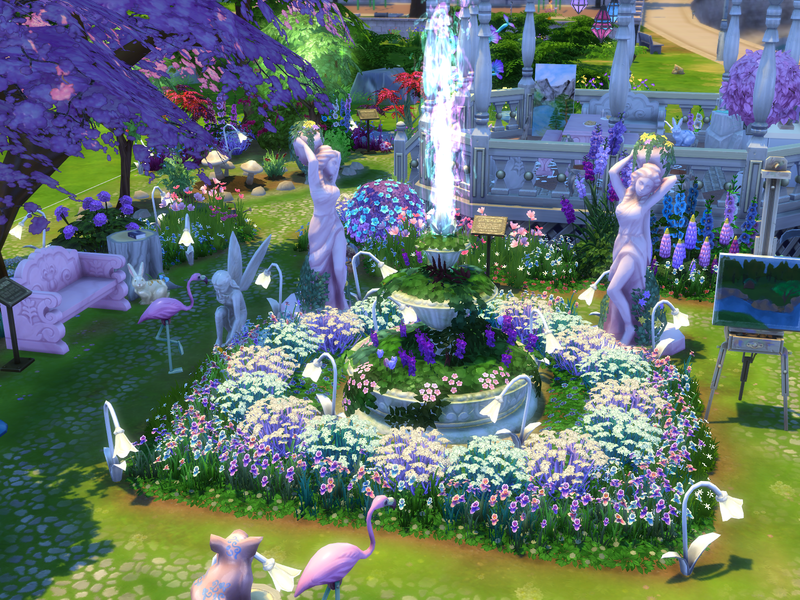 The waterfall windows, flower petals on the floor, and the statues there looks so very nice! It is a nice touch that one of the statues is carrying a some beauty products. The black and white patterned flooring gives a special look to the room! Very nice black, red and gold colour scheme of Dark Glamourous Ensuite! 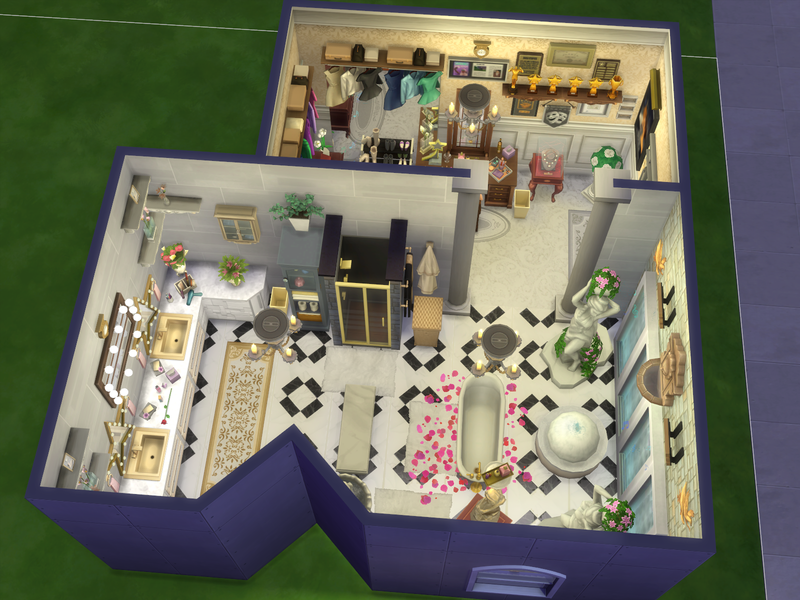 It is a very detailed and very nice bathroom! The patterned floor rug adds a very nice look to the room. The starry floor tiles with the pool lights on the them looks very nice! Very nice black marble flooring! 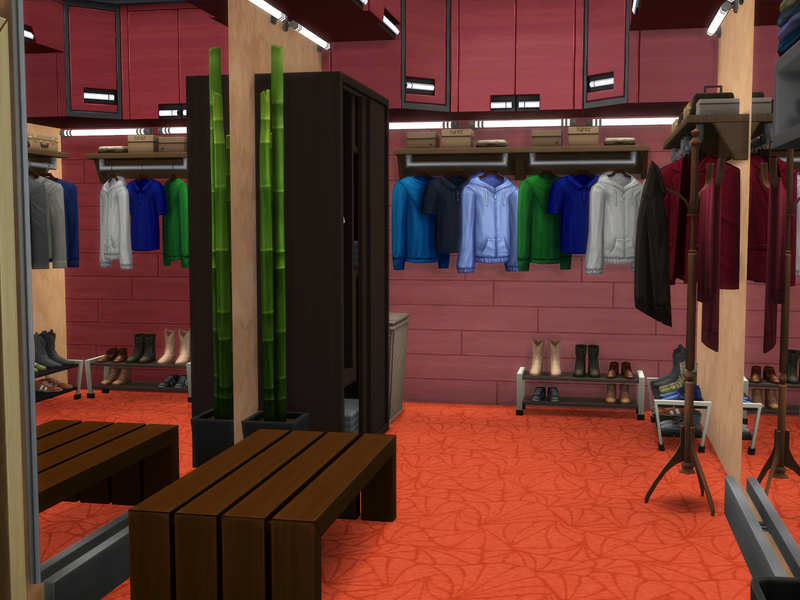 The clothes racks and shoes racks nook areas look very nice! 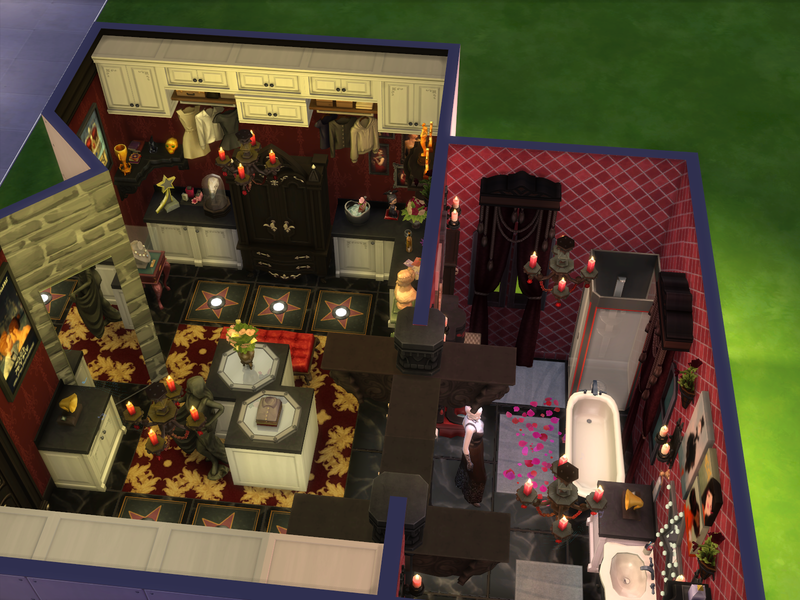 The red wall tiling in the bath tub area gives a nice look to the area. I won't write about all the special furnishing features, but the room is very elegantly nice! 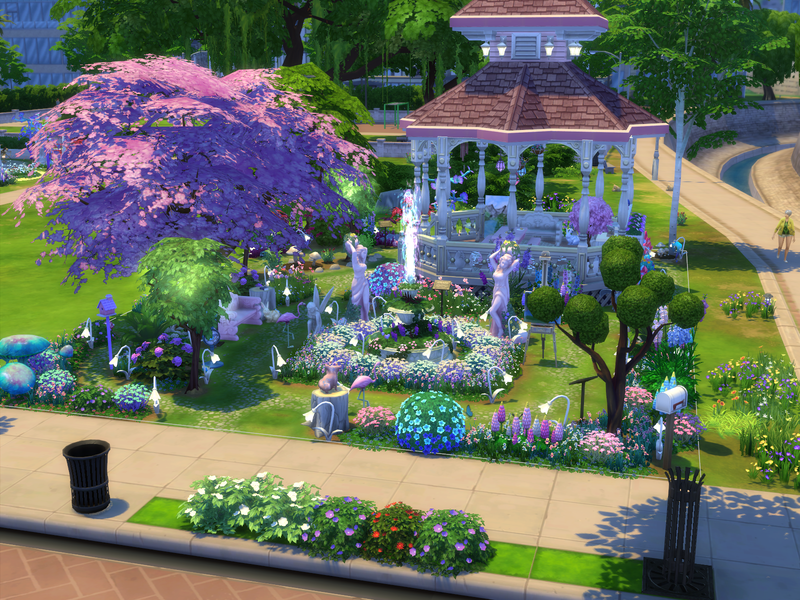 Mystical Garden is such a very pretty gazebo garden ! 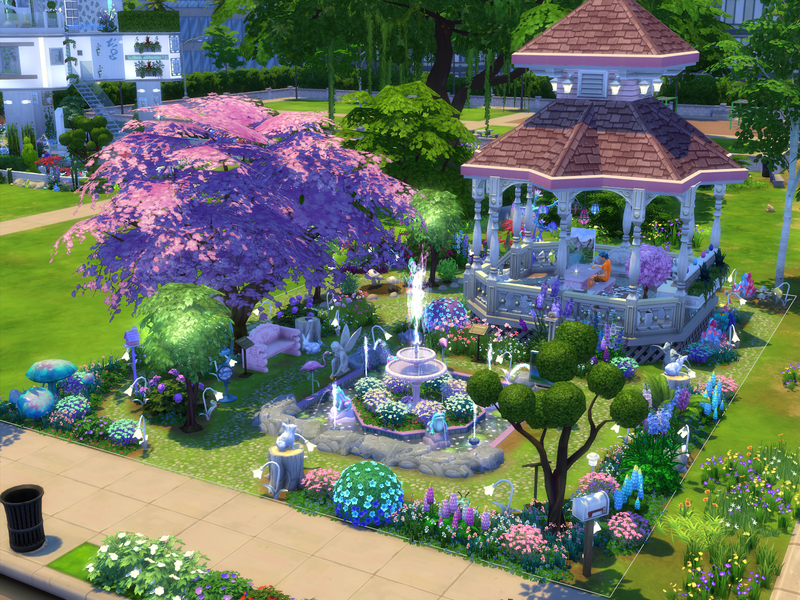 The flowers on the corner edges of the lot, and the flower beds on the edges of the gazebo look so pretty! Very nice exterior design of the gazebo! It looks so very great! The lights are a nice touch on the roofing. 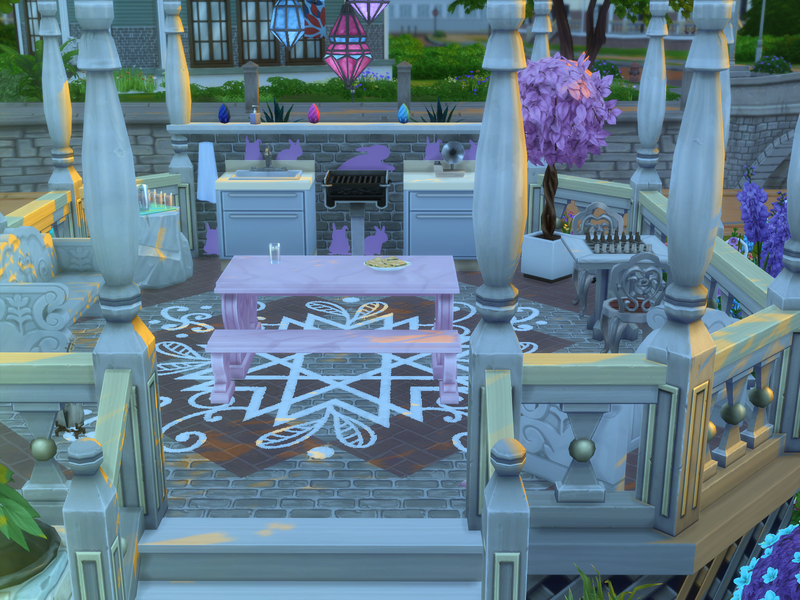 Very nice outdoors dining area in the gazebo for sims to enjoy cooking food on the grill and eating the meal at the pretty pink table. They will have fun playing chess there. The pink bunnies are a nice touch on the wall. The cherry blossom plant is a nice touch there. The white floor patterning print looks great! 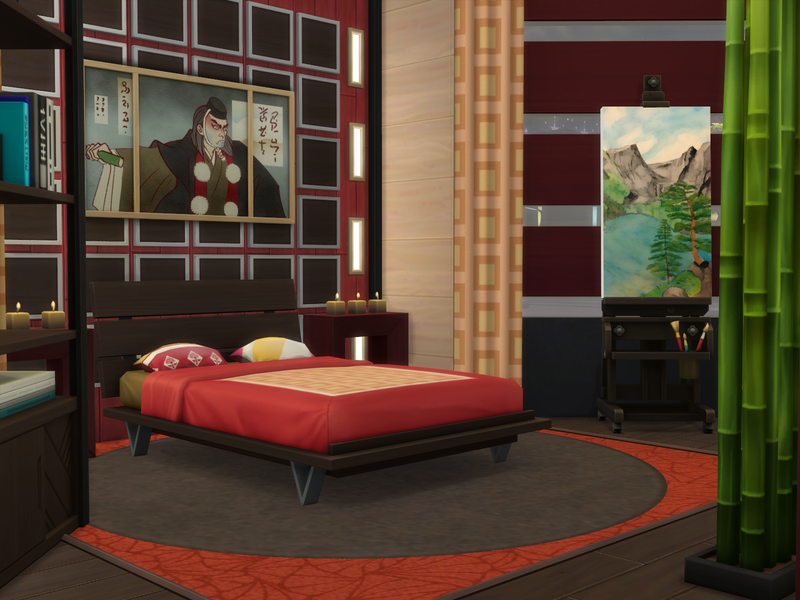 Very nice art nook there, and in the outside area, for sims to enjoy painting on the easels in a very nice setting! The crystals and alien plants look very nice how they are placed in the room. 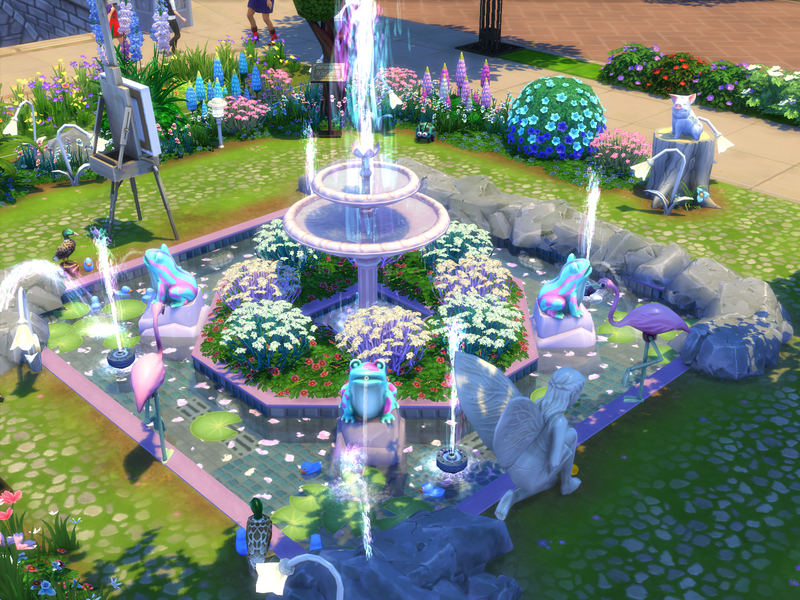 The water fountain centrepiece looks so very pretty! Very nice design of it! 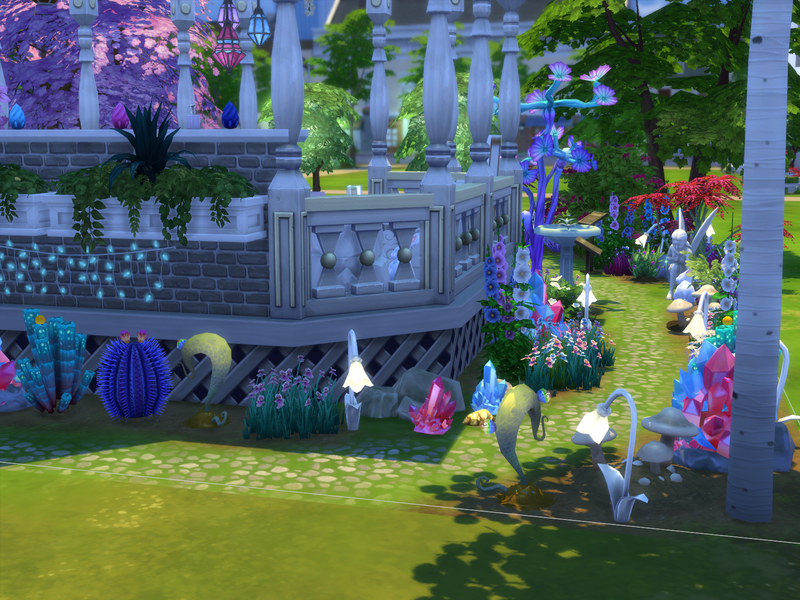 The water fountain, frogs fountains, rocks, flamingos and flowers that are a part of the feature look so nice! 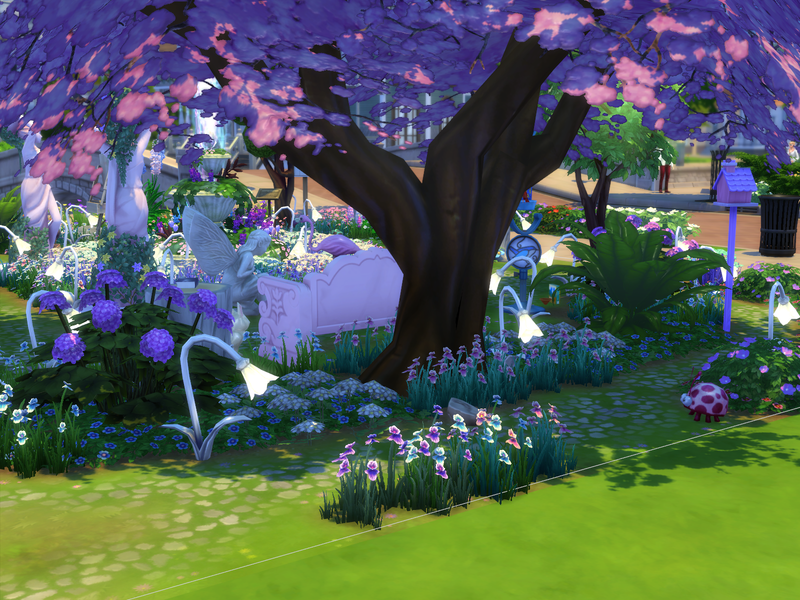 The fairy stautue is a nice touch for sims to see as they sit resting on the seat bench. The bunny there , lady bird and the pig on the entrance area stump look cute! The mushrooms look great in the garden. 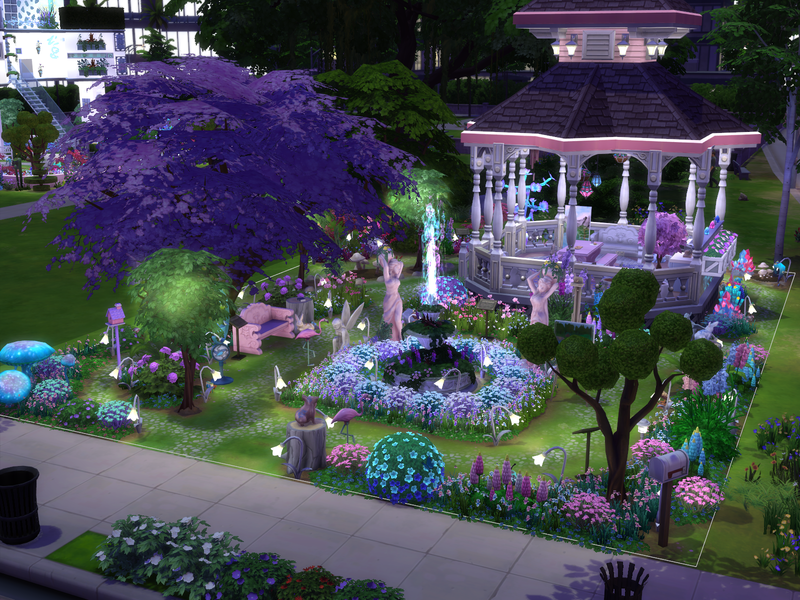 The pink birdhouse and glow fruit trees are a nice touch. 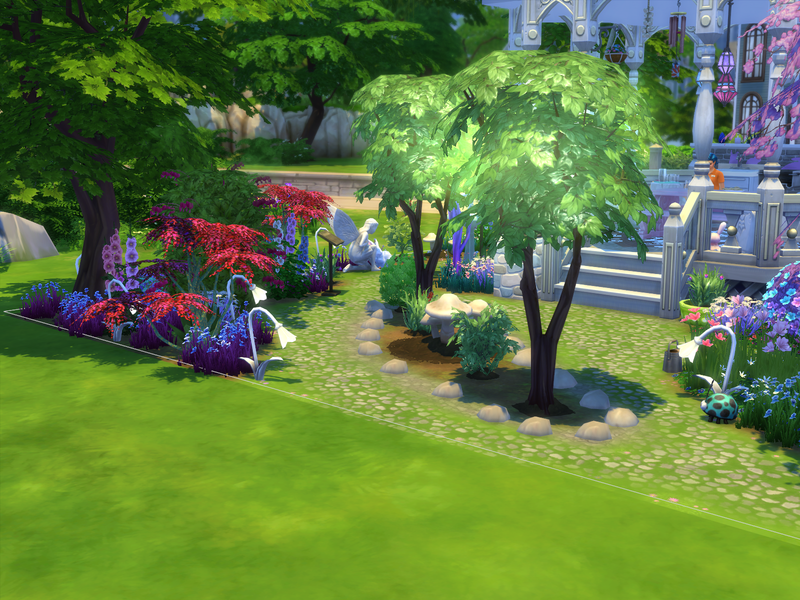 It is a very mystically nice garden!